April 10th, 2019: data available. April 26th, 2019: deadline for uploading results. April 30th, 2019: submission deadline for papers related to results/methods on the contest. May 5th, 2019: notification of contest papers acceptance. May 10th, 2019: registration deadline for contest papers. The main idea is to spatialize urban temperature predictions. It is well known that local temperatures are closely related to surrounding land cover. To this end, we provide time series of local temperatures issued from sensors located in various areas as well as spatial data to assess land cover. The goal is to provide hourly maps of local temperatures during one day. 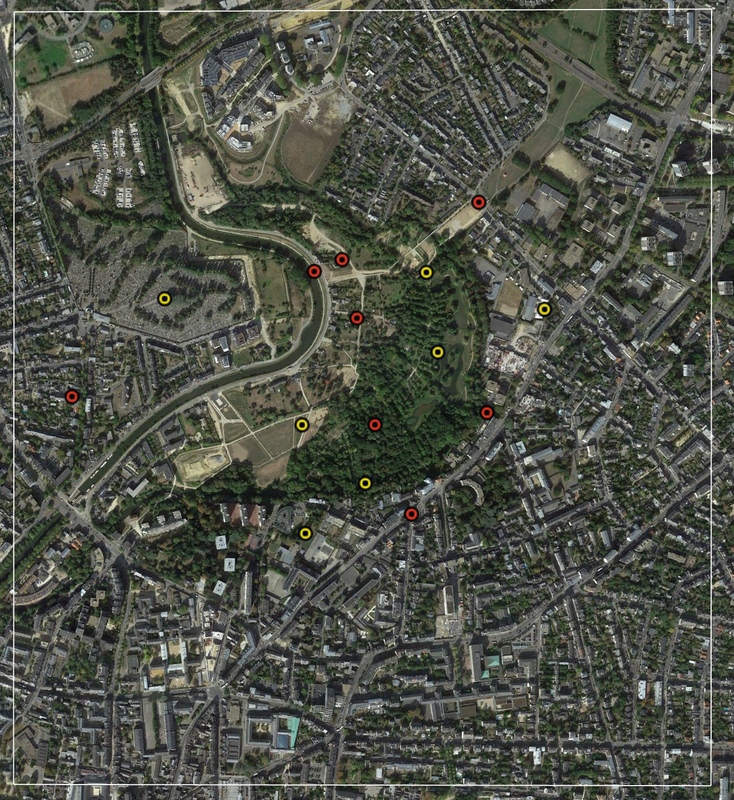 1 Hyperspectral image (160 bands) and 1 bispectral LiDAR (NIR and green channels) in a urban district of Rennes (France). 8 time series of 5 days (From July, 28th, 2015 to August, 1st, 2015, temporal resolution: 20 minutes) of temperatures issued from meteorological stations inside the observed area (location: the 8 red points). See the download page for technical details. Provide spatio-temporal series of temperature evolution (temporal resolution: 1 hour, spatial resolution: same that the given hyperspectral image) over July, 30th, 2015. RMSE using 7 meteorological stations (yellow points). Organizers: Jean Nabucet, Xavier Foissard, Vincent Dubreuil, Hervé Quénol, Thomas Corpetti, Sébastien Lefèvre.